Hi, I’m Jason, Co-Founder and CEO of Petal, a simple, no-fee credit card that doesn’t require a credit score. * This is probably the first time you’ve heard of Petal, so I’d like to tell you a little bit about what we’re building and why. Today, it’s hard to exist without a credit score. On some level, this makes sense. Your credit score reflects whether you’ve paid back debts you’ve had in the past. But what if you’ve never had any debt aside from a student loan? Or you’ve spent years of your life in another country, like millions of veterans and first- and second-generation immigrants? Or you rely on a debit card and your only experience with credit is observing how it’s gotten others into financial trouble? You’d be what the banking industry calls “credit invisible”, “unscorable” or “thin-file” and there are tens of millions of others just like you. If you’re new to credit, the banking industry has trouble seeing you for who you are. For the 25% of the population with access to a creditworthy cosigner with sufficient income, credit comes easy. Those consumers can build credit earlier and use safe and affordable credit products right away. For everyone else, it’s another story — one that’s littered with expensive products that are harmful to consumers: prepaid cards with high fees, subprime credit cards, car title and payday loans. This begins a vicious cycle: The lower your credit score, the more expensive your interest payments, and the more expensive your interest payments, the harder it is to make on-time payments and build your credit score. For those without the privilege of a qualified cosigner, it takes years of using introductory, high-interest products to build a good credit score from scratch, and any mishap along the way can lead down an entirely different path. The 65 million credit invisible, unscorable and thin-file consumers in the U.S. are not a snapshot of America. They are disproportionately likely to be young, black and Hispanic, first- and second-generation immigrant, and/or low- and moderate-income. The same groups that have been historically underserved by the banking system are routinely denied access and opportunity because of how the credit system works. Credit doesn’t have to work like this anymore. Credit scoring was developed 50 years ago at a time when very little financial information was available to make fast approval decisions. Since then, access to financial data has proliferated and powerful new statistical methods have been developed to analyze and understand it. All of your financial information is available today on the web and at your fingertips, but very little of this technology has been utilized to improve credit scoring. Software and mobile technologies have converged to make consumers’ lives easier and the products available to them more transparent, yet banks still use paper forms, clunky websites, and obscure, confusing terms. Modern technologies have transformed other industries, and credit should be no exception. But traditional credit card companies are rigid and resistant to change. They are massive, hulking operations with legacy systems, and have processes and infrastructure set in stone. They are the very imagery they invoke — slate and platinum, silver and sapphire. Despite working and paying bills responsibly, members of our team had trouble qualifying for a decent credit card and establishing credit history. Others on our team struggled with credit card debt and fees, experiencing how difficult traditional credit cards are to understand and manage. For us, credit was sideways, and we took up an audacious mission to fix it. Two years later, we’re launching Petal — a simple, no-fee credit card, designed to make life easier for everyone. Because we use more financial data than just a credit score, we have higher credit lines and better rates than competing cards, even for customers who have never had credit in the past. That means that more people can access safe and affordable credit and start building their credit scores earlier. Hidden fees and unclear interest charges don’t make anyone’s life easier, so we got rid of them. 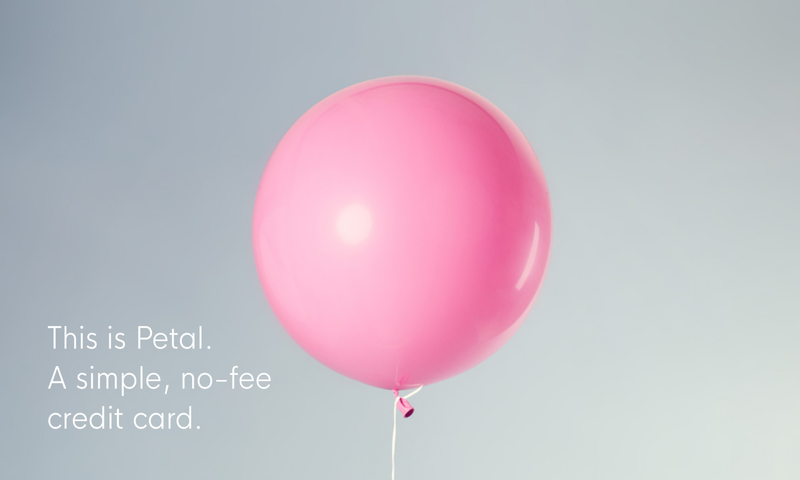 Petal is the first credit card with no fees whatsoever — no annual fees, no international fees, not even late fees. In fact, customers who pay their balance in-full each month never pay a dime in fees or interest. Petal makes money from merchants when customers swipe the card, and on interest when customers carry a balance past their due date. And before customers carry a balance, we show them exactly what it will cost — in dollars, not just in interest rates and APRs. It’s our belief that customers should be able to use credit safely and affordably, without falling into costly debt. For the last two years, we’ve been working behind the scenes — speaking with banks and financial institutions, working with regulators in Washington, D.C., and meeting with hundreds of future customers that would benefit from a new solution. Along the way, we found supportive, forward-thinking investors willing to put their faith in us and help make this vision a reality. Today, we make the journey public and invite you to join us. Today, we’re excited to announce Petal — credit that’s honest, simple and accessible for the millions of people who deserve it. Thanks for reading. I hope you’ll check out the product or recommend it to a friend who could use it. We have big plans in store for the near future, and are looking forward to sharing them with you. * Petal has absolutely no fees and a variable APR of 13.99% to 24.99%. This APR varies with the market based on the U.S. Prime Rate, accurate as of 9/15/17. Thoughts and updates from Petal Card, Inc.